Vendors must decide whether to acquire or develop blockchain technology now—years before their clients require it. Boston, March 2, 2017 – Many of the hundreds of chain-related deployments launched worldwide in 2016 are in development. Regulators as well as business leaders confront a twin challenge: grasping this new technology and passing new rules based on partially understood truths, pitfalls, and nuances. But blockchain platform vendors that are chosen by corporations or capital markets firms stand to make today’s emerging chains run as smoothly as TCP/IP does for the internet. Time is ticking, and these 10 chaintech platforms—Axoni AxCore, Chain Core, Digital Asset platform, Ethereum, Hyperledger’s Fabric, Nasdaq Linq, Overstock.com’s t0, R3’s Corda, SETL’s OpenCSD, and Symbiont’s Assembly—urgently need to be near the top of the pack to survive the inevitable cuts. This report addresses how competition takes place among these platforms and what strategic implementation options regulators, chaintech proponents, and incumbent settlement firms possess. It is based on qualitative Aite Group interviews from June 2016 to February 2017 with 30 senior executives from blockchain firms, financial markets utilities, technology firms, trading venues, industry groups, asset managers, and securities regulators. This 85-page Impact Report contains 21 figures and 20 tables. Clients of Aite Group’s Wealth Management service can download this report, the corresponding charts, and the Executive Impact Deck. 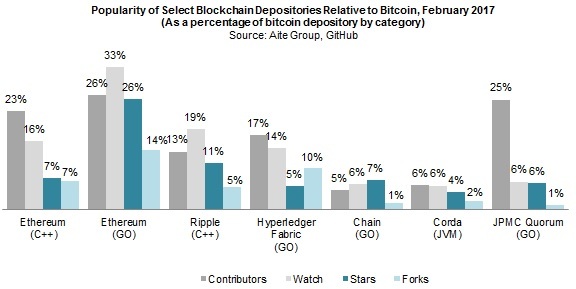 This report mentions: ABN AMRO, Accenture, Amazon, Andreessen Horowitz, ASX Group, Axoni/Tradeblock, Bank of America, Bank of New York Mellon, Barclays, BestX, Bitt.com, BlackRock, Blockstream, Bloq, BNP Paribas, Broadridge, CGI, CME Ventures, Calypso Technologies, Capco, Chain, Citigroup, Citi Ventures, Cobalt DL, Computershare, Credits, Credit Mutuel Arkea, Credit Suisse, DTCC, Deloitte, Deutsche Boerse Group, Digital Asset Holdings, Digital Currency Group, Electronic Transaction Clearing, Equinix, Ethereum, EY, Financial Industry Regulatory Authority, FIS, Fidelity Investments, First Data, Georgeson, GitHub, Goldman Sachs, Hacera, Hitachi, HSBC, Hyperledger Project, Hundsun Technologies, IBM, ICAP, ICBC, IHS Markit, Infosys, Intel, Ipreo, J.P. Morgan, Japan Exchange Group, Julia, KPMG, Keystone Capital, London Stock Exchange, Monetary Authority of Singapore, Medici Ventures, Microsoft, Mitsubishi UFJ Financial Group, Mizuho Financial Group, Monax (Eris) Industries, Multichain, Nasdaq, Northern Trust, NRI, NTT Data, Overstock.com, Paxos/itBit, PeerNova, PNC Financial, PricewaterhouseCoopers, Pro Securities, Rakuten, R3 CEV, Ripple, Royal Bank of Scotland, Santander InnoVentures, Sapient, SBI Securities, SETL, Securities Industry and Financial Markets Association, SettleMint, Source Capital Group, SpeedRoute, the state of Delaware, State Street Bank, Sumitomo Mitsui Trust Bank, Symbiont/Counterparty, Synechron, SIX Securities Services, Tata Consultancy Services, Thomson Reuters, Temenos, Visa, Wells Fargo, UBS, and the U.S. Securities and Exchange Commission.